They changed her name and I'm not sure why. 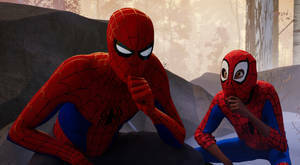 Into the Spiderverse is FANTASTIC. You got to go see it. Also, whoever made the call to give Gwen ballet slippers deserves a raise. Spider Gwen is one of my favorite comics, it's awesome to see you draw her! Yessss man. Please draw more of her. Pone crossover? It really was a great movie. And man, this is awesome too. I'm not completely kidding. I don't think. I loved the movie. Especially Gwen was brilliant. I didn't even realize they changed her name, though. Was the name Ghost Spider mentioned during the movie? If it was, I must have missed it. Anyway, awesome work with this masterpiece! Maybe I should look up more Marvel fan art sometimes. I want to watch that movie so badly. Great drawing of her. Yes, yes it is fantastic. Are you sure this will be the only Spiderverse character we see from you? Because if she ran around calling herself Spidergwen, folks might start wondering if this superhero's secret identity has the first name Gwen. Beautiful colors and a sweet dynamic pose! I assume the name change is because "spider-gwen" reveals her Identity (don't remember if they even use it in the comics) and it kinda fits her design. She was called "the Spiderwoman" by her enemies. The "the" makes it sound unofficial. I think "ghost spider" was a decent move on movie's part. Thank you for clarifying though! Ghost Spider's a great name and helps set her apart. piece is fantastic. Movie was simply awesome and a piece of art in of itself. They changed the name in initiation too, it sounds so weird. I thought she always had ballet slippers.